SPECTREOUTREACH.com: 22,700 young fashionistas at same place! 22,700 young fashionistas at same place! "Symbolic act draws on the character for “mori” (forest), which is made up of three tree symbols. Shibuya is the heart and retail center for most of the brands participating in the show" outside the Shibuya station. The Current theme for the Tokyo Girl Collection 7 edition is go eco-green! YI-HAAA! Let the Show *Shopping* Begin! All the hot latest fashion! My inner feeling that all the *innit* gals will go green with envy! 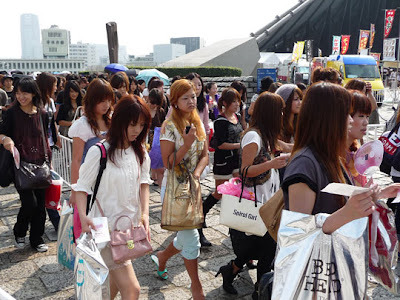 My verdict that "Stadium+Fashion+ Handphone+ Eco Friendly Reusable Bag+ 22,700 young fashionistas+ Live show+ Model" is super lethal way to earn lotsa moo-lah within 24 hour. That the truth!